Plan a road trip. See the country. Visit the national parks. Somehow we did—so can you! RealImaginaryWest 2018 Day 1—Our Adventure to (fill in the blank)! 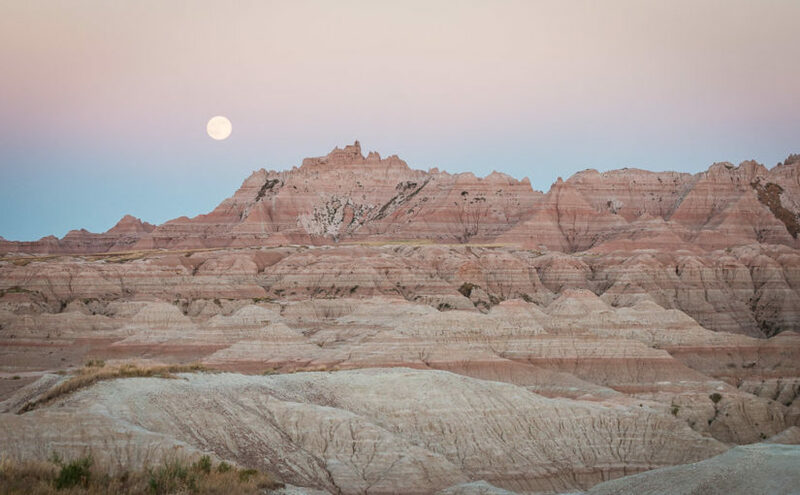 From our motel in Madison, Wisconsin, we followed I-90 West to Badlands National Park with brief stops at Green Giant Statue Park in Blue Earth, Minnesota and The Corn Palace in Mitchell, South Dakota. Despite getting in late last night, I was awake at 5am. I suppose it’s always harder to sleep in a new bed. By 6:30am we were out of the motel and refueling across the street. With all of our meat still solidly frozen, there was no need to buy ice for the cooler. After Becky grabbed a coffee at Starbucks, we were back on I-90 again by 6:50. It was a beautiful morning! Last time we passed through Wisconsin, the sky was a very strange color due to forest fire smoke from way up in Alaska and Canada. This time we had magnificent sunny blue skies and good early morning light. Wisconsin is wonderfully green and pretty in summer. We’ll definitely spend more time here on some future road trip. 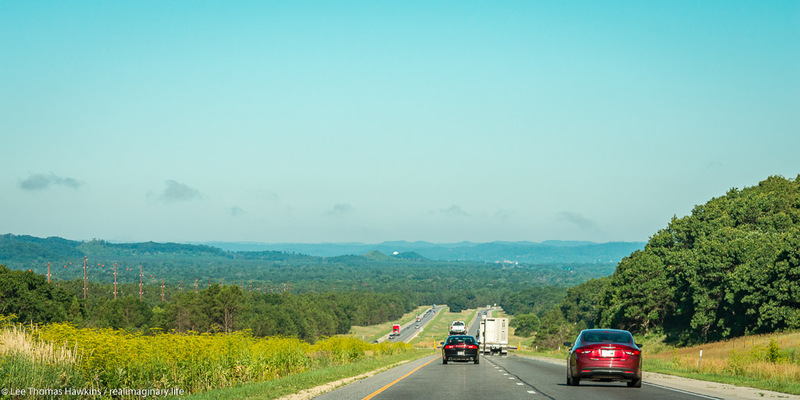 Since we got going early, there were no traffic problems through the often-congested Wisconsin Dells area. When we crossed the Mississippi River into Minnesota near LaCrosse, our chances of hitting any traffic at all dropped to almost nothing. 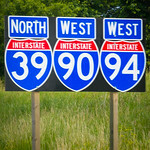 In the past we’d never been on I-90 across Minnesota beyond the first exit. 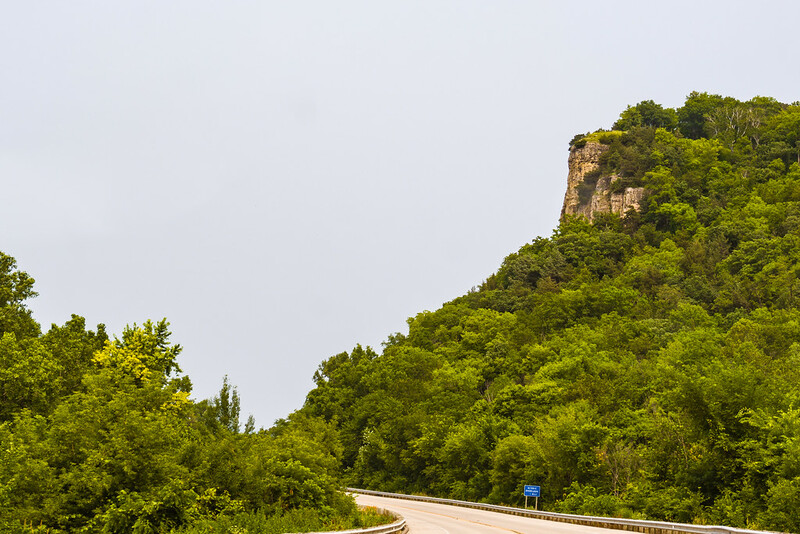 We gradually worked our way west from Pepin along the Mississippi through heavily-wooded regions of the state. As we passed directly west this time, we noticed a significant transition in the nature of the land. After winding up the hill from the Great River and onto Minnesota’s rolling hills, it was as if all the trees were different and more sparse. The land also transitioned from mostly woodland to entirely agricultural. This dramatic change told me we were now on the Great Plains. 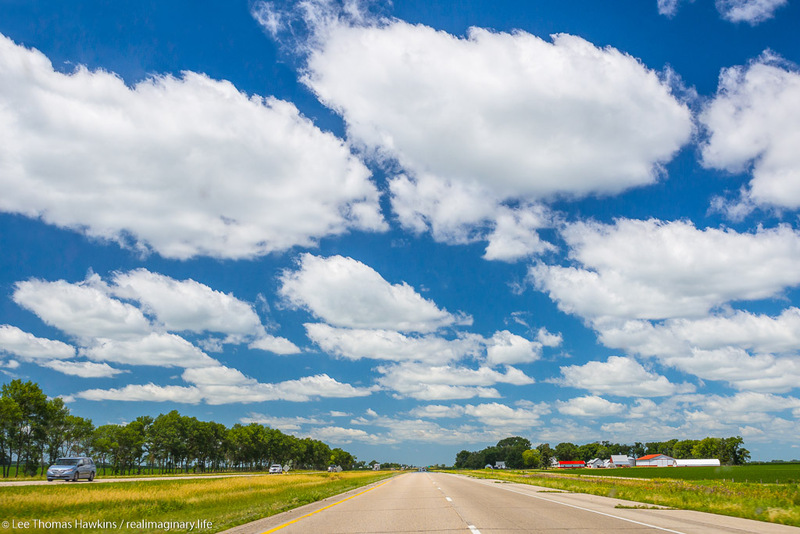 Cumulus clouds stretch across the sky over I-90 and prairie farmlands in Minnesota. 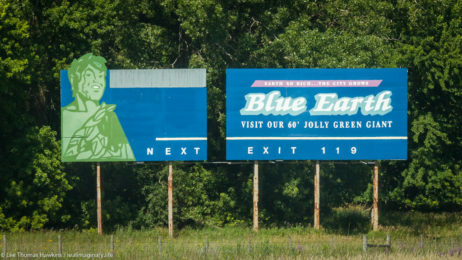 A billboard along I-90 encourages tourists to stop and visit the 60′ Jolly Green Giant in Blue Earth, Minnesota. By 10:50am we’d crossed half the state. We stopped for an early lunch in a small town called Blue Earth. Besides the town’s eccentric name, it also has a 55-foot, 8,000-pound statue of the Jolly Green Giant we have all seen on numerous Green Giant labels and television commercials. He made his first appearance at the dedication of I-90, as the very last section was completed near Blue Earth in 1978. 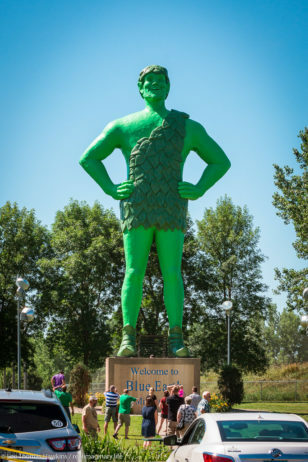 People gather at Green Giant Statue Park in Blue Earth, Minnesota to photograph a 60-foot tall statue of the Jolly Green Giant. At the time, the Green Giant company operated a canning plant in Blue Earth and was headquartered 60 miles north in Le Sueur. The idea for erecting the statue to attract travelers on the new transcontinental freeway originated with local radio station owner Paul Hedberg. On his weekend program he would interview families passing through Blue Earth on US-169, providing them with samples of Green Giant vegetables. Many children inevitably asked where they could see the Jolly Green Giant. So with the company’s blessing, Mr. Hedberg assembled funding from local businesses to bring the Giant to life in time for the freeway dedication. One year later, the Green Giant company merged with Pillsbury, and the brand has changed hands a few times throughout the years. However. another company still continues to can corn and peas at the plant in Blue Earth. And the statue attracts 10,000 annual visitors. Each year the Giant Days festival is held at the adjacent Fairbault County Fairgrounds. 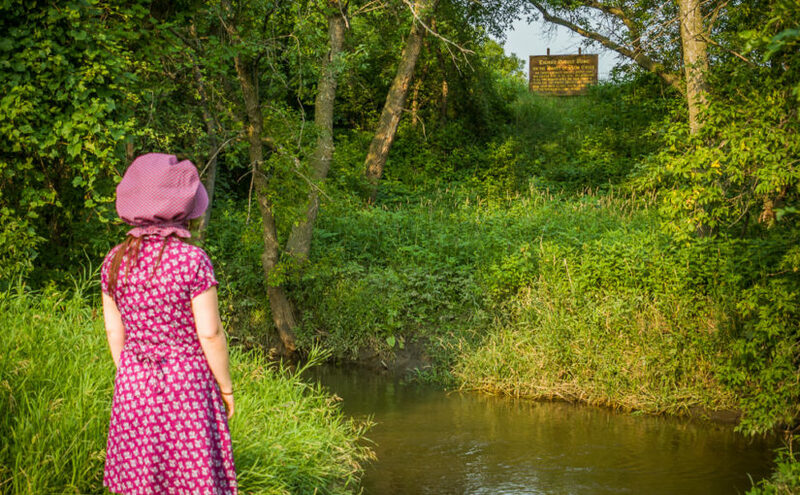 We crossed the entire state of Minnesota, stopping in Walnut Grove, the settings for Laura Ingalls Wilder’s book, On the Banks of Plum Creek and the Little House on the Prairie television series. We then drove to the Ingalls Homestead in De Smet, South Dakota. I thought this would be a short one today, seeing as our only true destination was our next Laura Ingalls stop, Walnut Grove, Minnesota. We hadn’t planned on staying in Walnut Grove, but rather we intended to carry on to DeSmet, South Dakota, our third and final Laura Ingalls stop. We had six hours of driving to be followed by one day and two nights of exploring DeSmet and relaxing! Unfortunately, our first night in South Dakota did not go quite as we planned…which I’ll get to after a few reflections on the last of our time in Pepin, the drive across Minnesota, and our visit to the Laura Ingalls museum there in Walnut Grove. It was our first day packing up the tent and the campsite on this trip, plus we got back to the campsite late after sailing Lake Pepin, so I was nervous about getting a jump on the day. So nervous, actually, that I didn’t bother to shoot a pano of our campsite until after we’d packed the whole thing up. Before we left, I wanted to grab a pano of the waterfront at the center of town. Plus, we had been invited by our new friends from the cruise to brunch, so we thought we’d at least take a few minutes to have coffee with them. 360-degree panorama of our campsite at Lake Pepin Campground. Click and drag to look around. Click the top right button to go full-screen. It was funny, though…when we went to shoot the pano, we saw Maria from our cruise perusing the streets just soaking everything in and enjoying it. 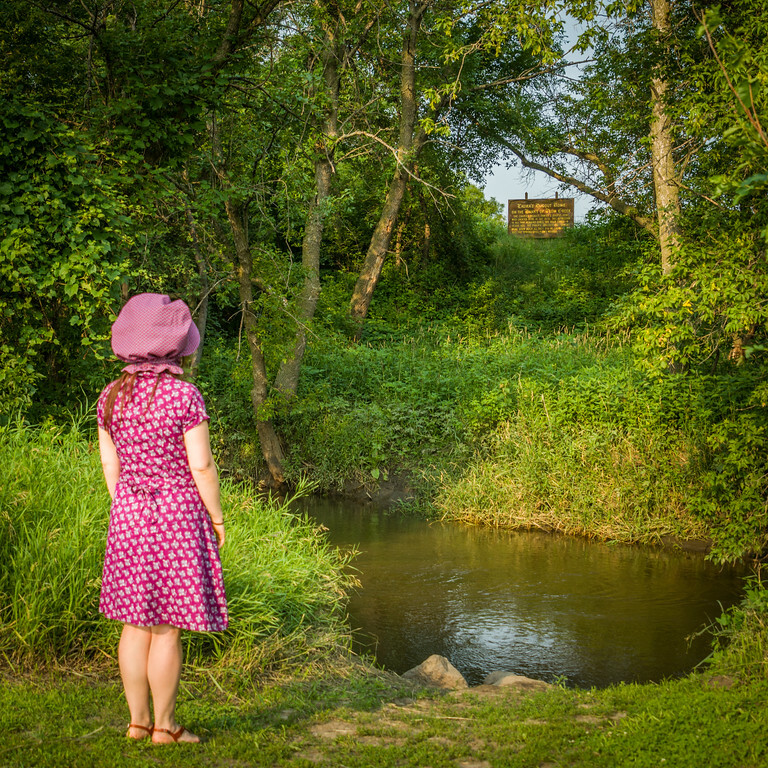 And Pepin really was a very special-feeling place…great for Laura Ingalls lovers, art walks, and bumming along the riverfront. It felt like being at the beach, except it was a river instead of an ocean, and it was Wisconsin instead of the East Coast. Maria hung out with us after I shot the pano, as we were looking for Dave to see if we could find a tool I use to blow the dust off of my lens. She, as everyone else but the captain on the cruise, was from Minneapolis, and told of how she worked for many years with the family business in worldwide shipping. Her family was Greek, and she ran much of the company with her brother until recently when she retired and started her own business as a wellness coach. She shared how she was always more laid back than her brother, and that she really enjoys having a much more zen lifestyle than she had with the craziness of running the shipping business. She certainly seemed to be having a wonderful weekend so far, and it was great to see someone enjoying life like she was. 360-degree panorama at First & Main in Pepin, Wisconsin. Click and drag to look around. Click the top right button to go full-screen. We then went out to our friends’ farm, about two miles out of town. The family was extremely hospitable, and their farmhouse and all their property was beautifully manicured and had a lot of old-fashioned charm. They were a wonderful family to have met, and we really enjoyed their company! They gave us a few suggestions of sights to see in South Dakota and suggested taking in as much of the Mississippi River as we could. We decided to take their advice and proceeded to take a slightly more northern route along the river west of Pepin. Then we meandered our way across Minnesota, working our way to US-14 at Nicollet. Minnesota was all rolling hills as far as we could see. Eastern Minnesota was forested with a few farms, giving way to fewer trees and almost exclusively farmland with a few small towns here and there as we proceeded west. Eventually we arrived at Walnut Grove. We may have seen about four cars for the last half of that—I’m not sure if that’s because of lack of population density and tourism, or just because it was July 4th. 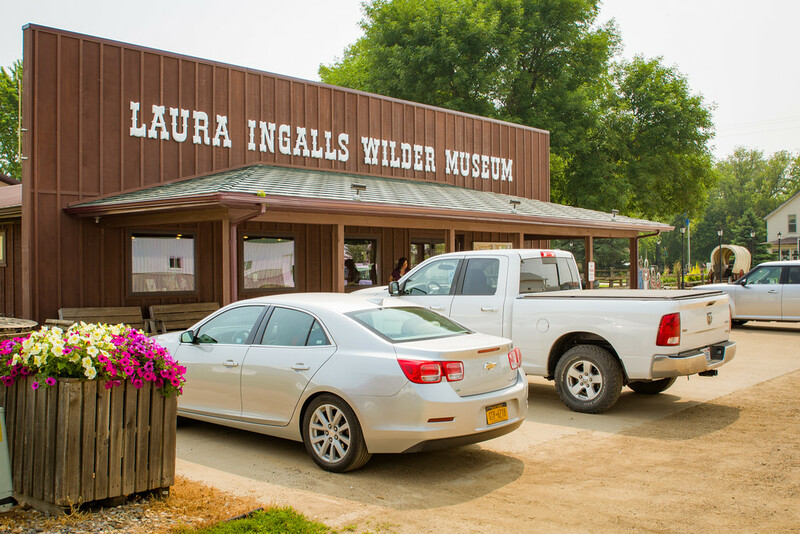 Either way, roads and streets were extremely quiet, and there were very few people at the Laura Ingalls Wilder Museum in Walnut Grove, which I’m told was wall-to-wall people just the day before. We drove from Motel 6 in Janesville to Pepin, Wisconsin, a village on the Mississippi River. Laura Ingalls Wilder’s book, Little House in the Big Woods takes place here, where she lived as a small child seven miles outside of town. Today we got a much later start than I had hoped, but it seems like everything somehow worked out. We left the Motel 6 in Janesville (they left the light on for us, but we turned it off before we left) right around 11am and headed north (or west…whatever) on I-90 past Madison and Wisconsin Dells on up to the Mississippi River. 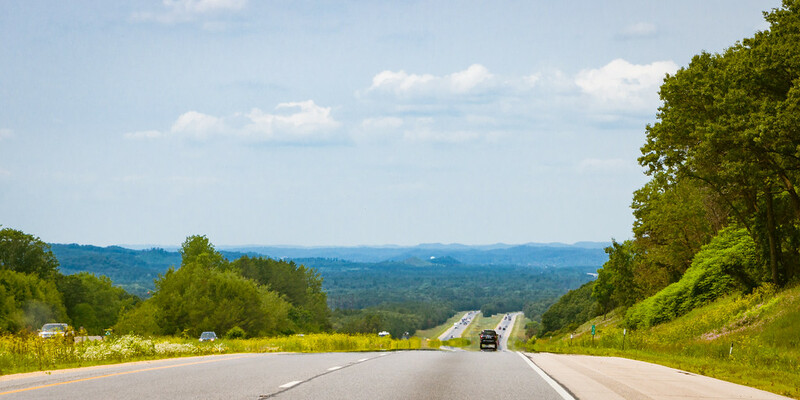 We were really impressed with the gorgeous rolling hills around Madison and on up through Wisconsin Dells. Everything everywhere was just wonderfully green and lush, and everyplace seemed very well-manicured and maintained, which is wonderful to see. 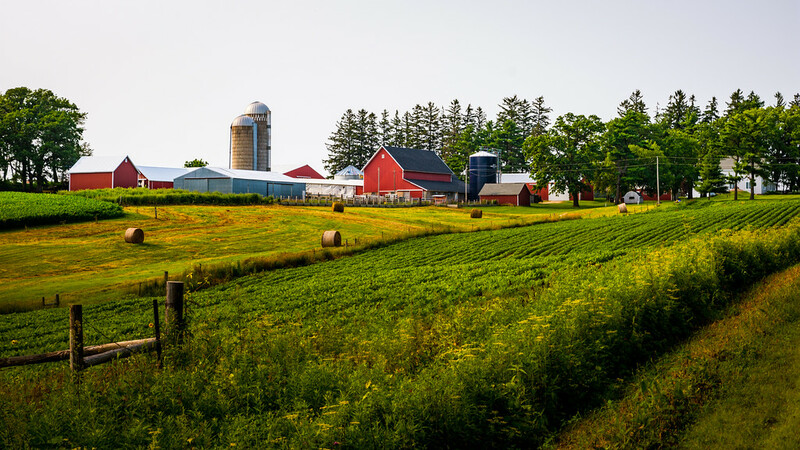 Lots of times you would see modern industrial and commercial buildings, and sure enough, behind it would be a farm—something that is novel for me to see right next to suburban buildings. Now once we got further north, the flora seemed to change to having more conifers in the mix and things weren’t quite a lush green anymore—they were more of a California or Rocky Mountain green, but not quite that color. It also got hazier and hazier, and that was likely because smoke was blowing in from forest fires burning all the way up in Canada. What was also strange was that there were huge valleys that would open up, and lots of times you’d even see small mountains that were too small to be considered officially mountains—maybe we could call them “dwarf mountains“. 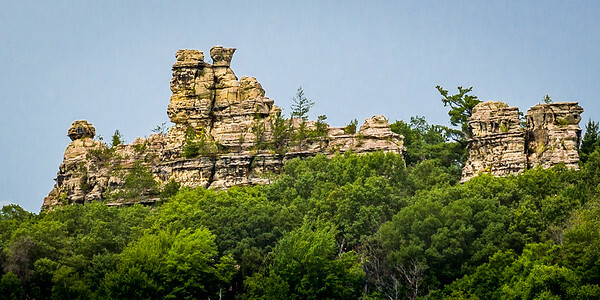 You’d see naked rocks that looked as old as time standing in the middle of a bunch of trees next to the freeway too…something else that I never associated with Wisconsin or Minnesota. 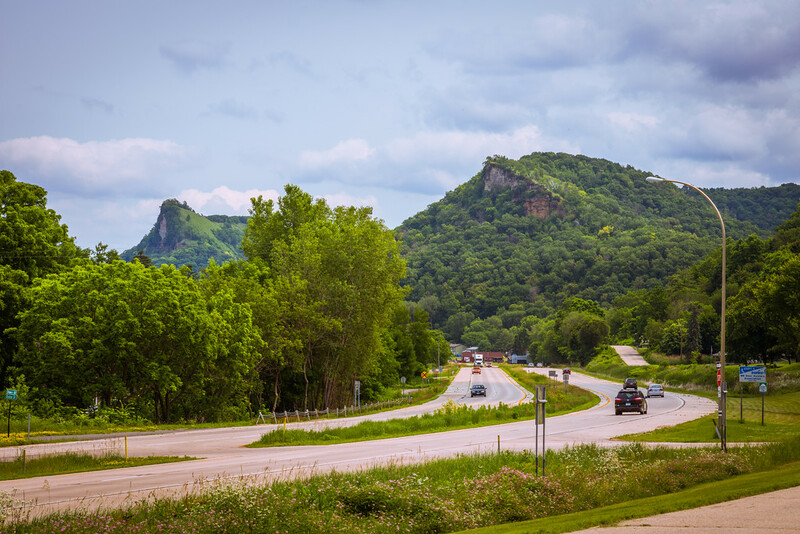 King’s & Queen’s Bluff from US-61 as it winds along the Mississippi River north of I-90 near Winona, Minnesota. Eventually we passed LaCrosse and went over the Mississippi River into Minnesota on I-90 and US-61, which parallels the Mississippi. US-61 actually follows the Great River all the way into Minneapolis, and there are busy railroads on both sides of the river carrying trains. Many of the trains heading south are all tanker cars, probably full of North Dakota crude oil bound for refineries in Louisiana. All along the river there were heavily-wooded bluffs with dwarf mountains, knolls, knobs, and rock outcroppings breaking up the trees. We crossed back into Wisconsin at Wabasha on MN-60/WI-25 to go to Pepin. 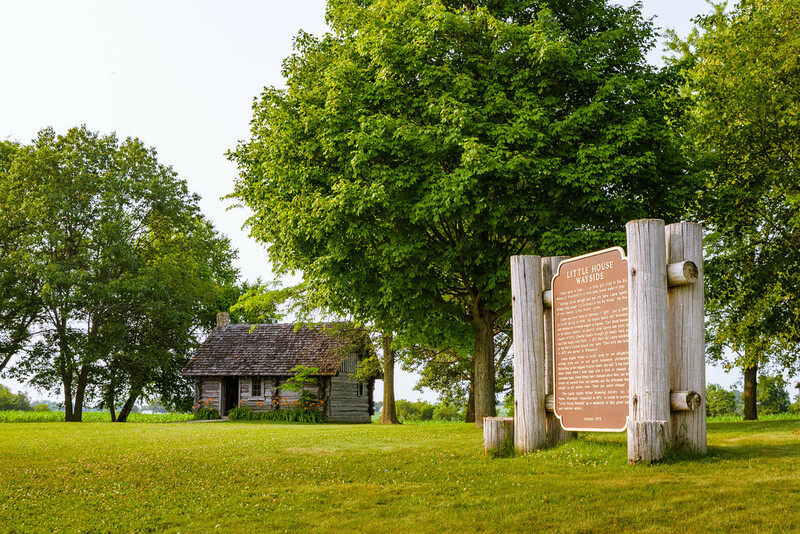 This is where Laura Ingalls Wilder was born and lived as a little girl, and where she got inspiration to write Little House in the Big Woods. They have a museum there, and about 7 miles out of town there’s a replica log cabin. Pepin from WI-35 seems unremarkable in town, with a few little stores you’d see anywhere else, and a little motel with a campground where we stayed. 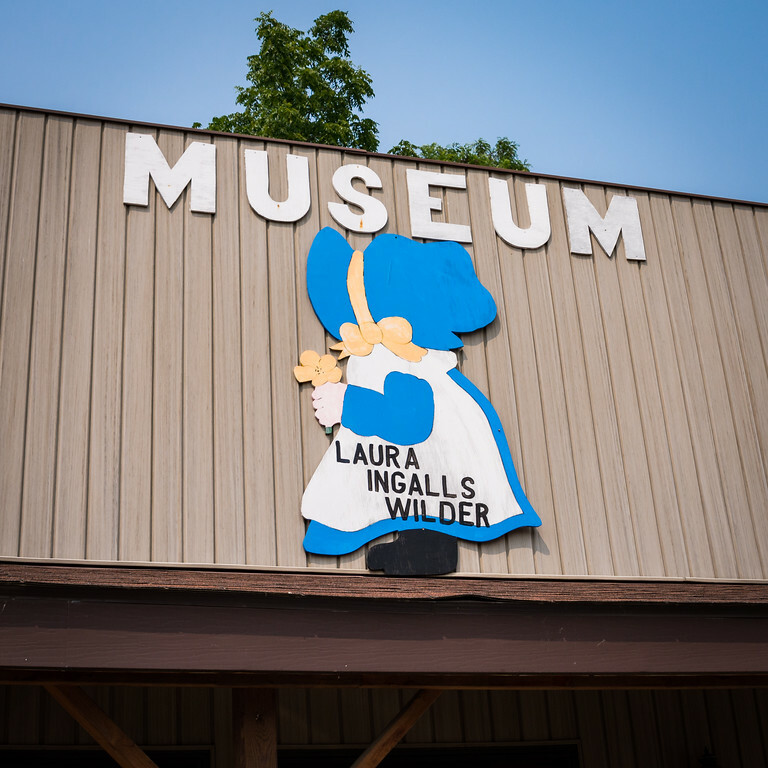 The biggest attraction on the main street was the Laura Ingalls Wilder Museum. 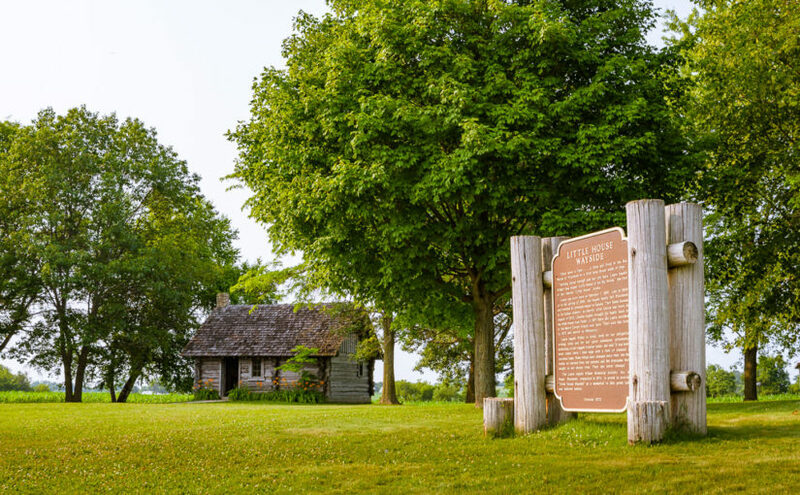 Admission is only $5 and they have plenty of artifacts from the era when Laura and her family lived in Pepin Township, including cook stoves, clothing, tools, a covered wagon, and canoes used to fish on Lake Pepin. 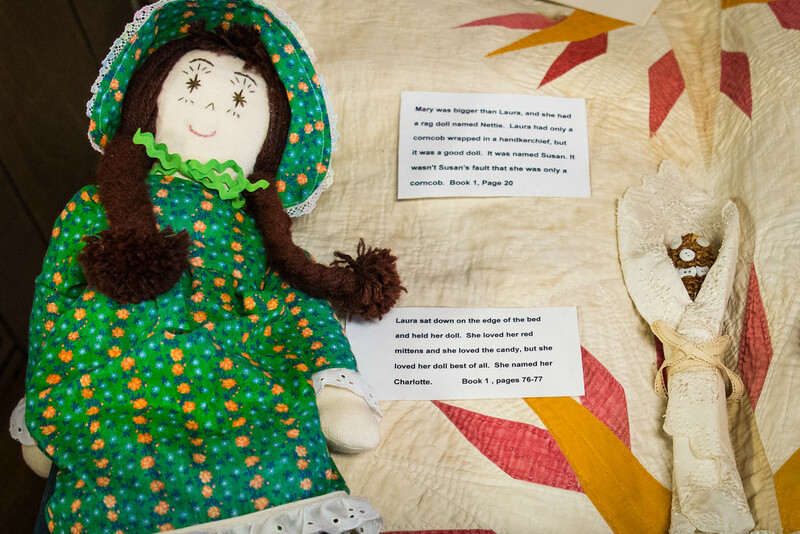 Dolls like Laura’s in Little House in the Big Woods. Her first doll, Susan, couldn’t help that she was a corn cob. We followed County Road CC out to the Little House Wayside Cabin, built in 1978 just a few hundred feet from where Charles & Caroline Ingalls started their family. The countryside round about the town was incredible! Beautiful farms and woods were all along the winding highway. We saw several farms that looked like they belonged on postcards.